Stay in family apartments for 3-4 people. Lots of options like BBQ, Yoga, skating, bike tour, island hopping, horseriding, snorkeling, fishing, ping-pong, hiking and more. Large range of equipment from boards to wetsuits to boots to wax – all you need! Multilingual and licensed surf instructors head to different spots every day. Maximum eight people in one group to learn how to surf faster. Lessons include surf theory units. In the vivid city Corralejo. Only few meters to the beach and the closest surf spot. City center and skate park are also in close proximity. Surf camp bookable all year long. Suitable for families with kids. Easy travel and cheap flights from all over Europe. Shuttle service from the nearby airport. Surfing is a kind of sport and passion that you can share with the entire family. With that in mind, we offer a family surf camp in Fuerteventura, where all the members of the family can experience the chilled-out surfer vibe and everyone can get their money’s worth. Between daily stress, different hobbies and other time-consuming duties of everyday life, it can get quite difficult to organise joint ventures with the family. Hence, our family surf camp in Fuerteventura provides a really simple option for the big and the small to experience a holiday of a very special sort. You can all learn to surf together step-by-step and feel the family connection getting stronger again though sharing this adventure. Fuerteventura is the ideal place for a family surf trip. 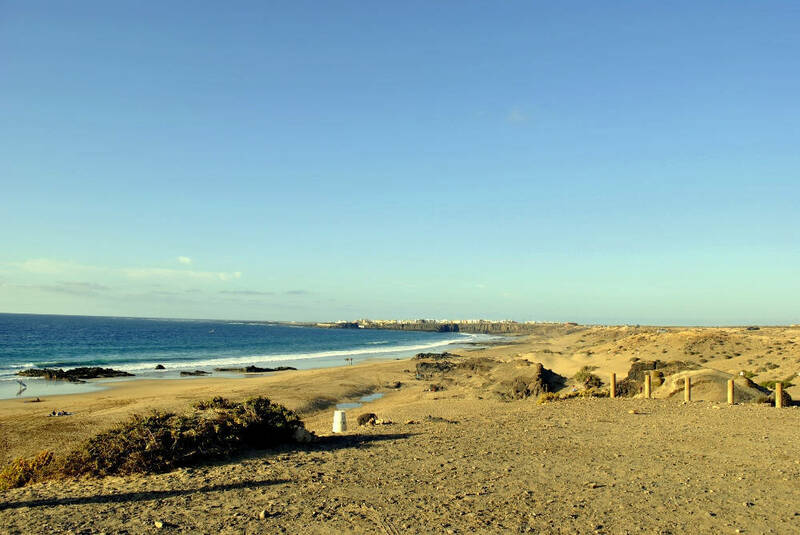 Temperatures vary between 24 and 28 degrees during the whole year, making Fuerteventura the island of eternal summer. Due to the island’s location on the Atlantic Ocean, there are always fantastic waves for surfers at all levels as well as breath-taking beaches and countless reefs on the endless coastline. Fuerteventura offers many other activities for people of all ages besides surfing, like mini-golfing, a water park, many charming restaurants, breath-taking sights, playgrounds and many more. 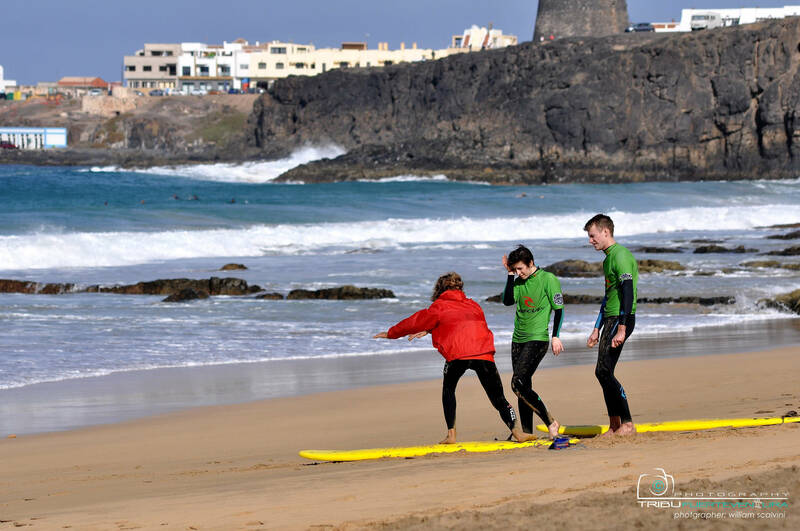 The family surf camp is, just like our adult surf camp on Fuerteventura, located in Corralejo, a charming town in the north of the island. Within walking distance from the camp is a beautiful beach, where you can not only go work on your tan, but also go surfing. However, the last thing we want is for you to get bored with just one spot, so we will drive you with our Planet Surf vans to other surf spots all over the island, depending on where the waves are best that day. We will find the best surf spot for your level of experience: for example, we can show you the best spot for beginners to learn – El Cotillo, or we can take you to the north shore of Fuerteventura, which is more suitable for intermediate and experienced surfers. 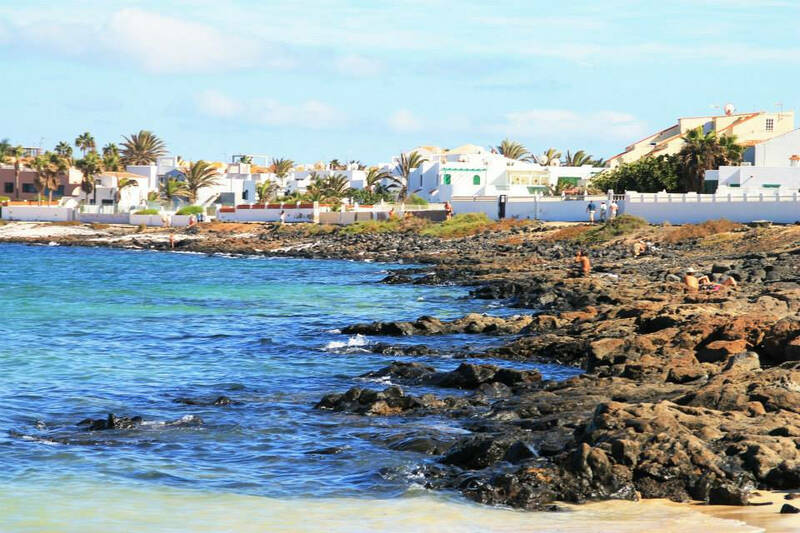 The town of Corralejo itself, besides surfing, offers plenty of restaurants for every wallet and every palate. You can find everything from typical Canarian food to Spanish, Italian or even Japanese, and for the evening – there’s more than enough bars where you can get a drink and have a boogie! You will also find that the whole family will be excited to go on a shopping spree here, as pretty much every surf, skate or snow brand has an outlet in town! Of course, we are not the only providers who have noticed that Corralejo’s many different qualities. Many more surf camps have settled down here, but we differ from them because of our extensive experience gained through years of running our surf camps in France and Spain. Most importantly, our founders grew up in the Canary Islands and know the area like the back of their hand, so who better than locals to show you the best surf spots every day and guarantee the best waves for your level? Additionally, we are very proud that our adult surf camp and the family surf camp in Fuerteventura are one of the few official surf camps that are part of the Canarian and Spanish Surf Federation in Fuerteventura!